A truly portable, easy to use, and sanitary means of human waste disposal that sets up in seconds. The three legged, portable toilet folds into briefcase size, weighing only 7 lbs., yet is the same height as a standard toilet. Special degradable, puncture resistant, landfill approved bags contain a powder that gels liquids, catalyzes decay, and removes odor. 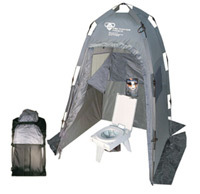 The complete system includes: the portable toilet; 15 waste bags with powder, toilet paper, hand sanitizer, and zip close disposal bag; a floorless, 6’6” x 4’ x 4’ privacy tent with three closable windows; and a backpack. The backpack is specially designed to hold the entire portable toilet system, including a pocket for carrying used bags when necessary. The complete system weighs only 19 lbs. Next time you have to go, you will be glad you have your Clean Waste® system. Folds into Briefcase Size with Dimensions of 19" x 14" x 5"
LIGHTWEIGHT: Weighs only 7 lbs. 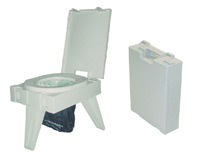 Includes the Clean Waste® (Portable Environmental Toilet) and three WAG™ bag kits. 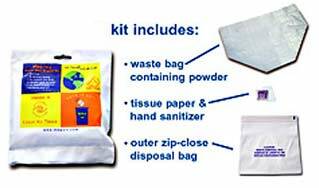 WAG™ bag kits are degradable and are approved for disposal in any garbage can. Can be used in standard toilet when water or power is off. The WAG™ bag kits can be used with the Clean Waste® (Portable Environmental Toilet) or by themselves while hiking, backpacking, rock climbing, kayaking, or in an emergency. These kits are sold singly or in packs of 12, 50 or 100. Canister contains 120 uses of the amazing Pooh-Powder™. 1 scoop of powder gels 60 oz. of waste, neutralizes odor, and acts as a decay catalyst. For use with your bags or for additional gelling capacity in WAG™ bags.